a) One of the high priests. b) A leader at the Capernaum synagogue. 2. How old was his sick daughter? 3. Since the woman in the crowd had an illness that made her unclean and prohibited from touching people, what did she touch in order to be healed? a) The hem of Jesus’ garment. b) The sandals of Jesus. 4. What did Jesus say was the main factor in her healing? a) Her perseverance in trying to get healing for twelve years. b) Her faith in Jesus. 5. Before Jesus reached the home of Jairus, what happened to his daughter? 6. Who were the two sisters of Lazarus? 7. Why didn’t Jesus go to Bethany as soon as he heard that Lazarus was sick? a) The delay would allow Lazarus to die and his resurrection would bring much glory to God. b) Jesus was too busy teaching and performing miracles on the other side of the River Jordan. 8. Why was it dangerous for Jesus to go to Judea, the area where Bethany was located? a) The Jewish leaders were trying to kill him. b) There were thieves and bandits along the way. 9. By the time Jesus reached Bethany, how long had Lazarus been dead? 10. 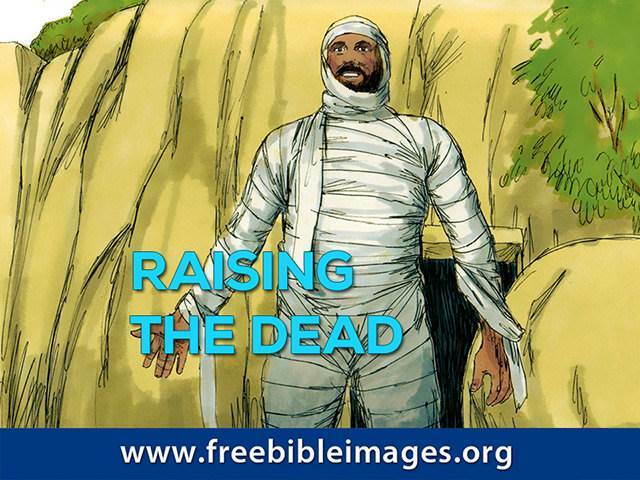 When Jesus shouted, “Lazarus, come out!”, he rose from the dead and came out of the tomb.